Widening of subdural space filled with a Csf density collection. • The most common cause. • Arachnoid tears and Arachnoid - dura separations which commonly occur near sylvian fissure appears to be the possible mechanism which results in CSF escape into subdural space. • Reported in approximately 10% of head injuries, provided it is moderate to severe type. Associated fractures in approximately 35% cases. • Usually appears after a week on follow up imaging as a new finding. • When associated with other intracranial post traumatic lesions like subdural hematoma, epidural hematoma, intracerebral hemorrhage termed as complex hygroma. Other uncommon causes are meningitis, Post ventricular shunting or lumbar puncture over drainage. A post trauma pt, 1st is on admission CT. 2nd is follow up CT after 5days showing bilateral subdural hygroma, widening of subdural space with density same as that of Csf. Crescent-shaped extra axial collection with CSF density on CT or signal intensity on MRI. Usually bilateral often more or less symmetrical. Displaces cerebral cortex and cortical veins. Gyri are significantly displaced away from calvaria. 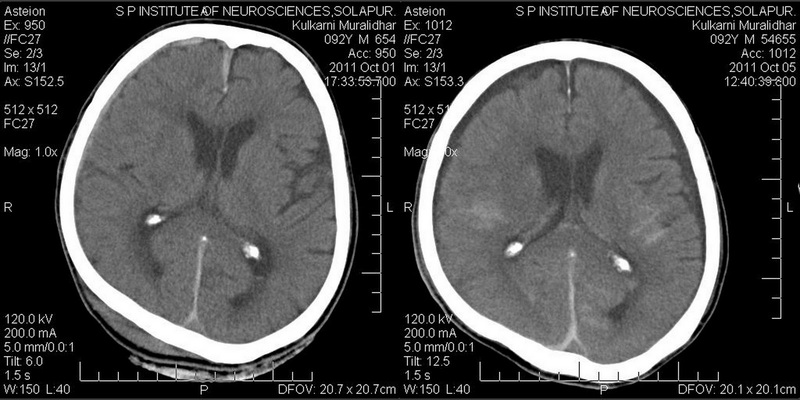 No widening of cortical sulci, rather sulci may be obliterated with flattening of gyri due to mass effect. A new finding on follow up imaging. 1. Chronic subdural hematoma: the closest differential which is usually unilateral and asymmetrical if bilateral. 2. Cerebral cortical atrophy: In atrophy, subarachnoid space is widened, the cortical veins traversing widened CSF spaces over cerebral convexities favours atrophy best seen on post contrast T1 MRI. In hygroma cerebral cortex and cortical veins are displaced away from calvaria. Cortical veins seen only along the margin of displaced cortex and do not traverse fluid collections over cerebral convexities. Definitive diagnosis is possible only by trephine openings in bone calvarium. Chronic subdural hematoma contains dark "motor oil" fluid which does not clot and devoid of pre albumin. Hygroma is a clear fluid and under pressure contains pre albumin. Both spontaneous regression with cerebral expansion as well as progression of hygroma with further complication is known. Progression of hygroma can occur due to transudation or further CSF accumulation due to flap-valve mechanism. Widening of sub dural space causing stretching and rupture of bridging veins, bleeding in the same or newly formed sub dural space. Great info. Thank you for sharing your technique. Looking forward for more updates.